Spider-Man fans have long wanted to see Miles Morales on the big screen. They will get their wish in a few weeks when Spider-Man: Into the Spider-Verse opens on December 14. The half-Puerto Rican, half-African American teen who takes over for Peter Parker will make his debut as an animated character, but Spider-Man: Homecoming officially brought the character into the live-action world. There is no word yet when he may be seen in the MCU, if at all, but one up and coming musician hopes to play Miles when it happens. 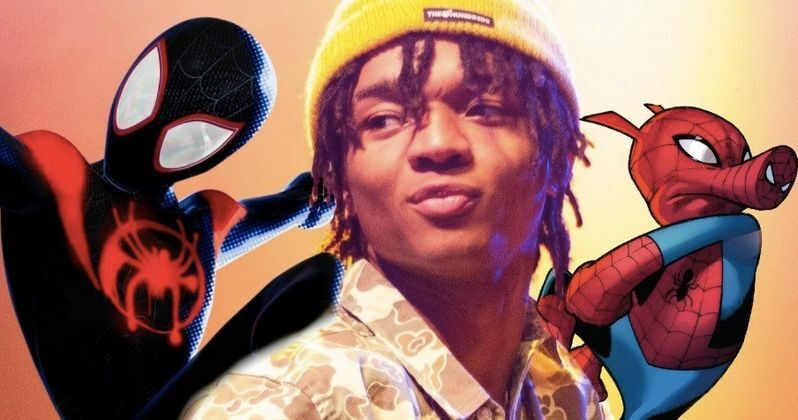 Swae Lee is a musician on the rise, and he has a pretty great track on the Spider-Man: Into the Spider-Verse soundtrack. He collaborated with Post Malone on the song Sunflower, which has an animated music video. Now, Swae Lee is throwing his hat in the ring to be the first black actor to play Spider-Man in a live-action movie. Lee has appeared in quite a few music videos over the last handful of years, but his first and only real acting role came in the sequel Boo2! A Madea Halloween, where he was credited under the name Khalif Brown. Swae Lee has his sights set on Marvel, with the rapper expressing deep interest in playing Miles Morales. He had this to say about trying to win the role. "It's only right that if anyone's going to be the first black Spider-Main in a real movie it should be me. Especially since I made the soundtrack and the song Miles Morales was singing in the movie. It's only right that I be the black Spider-Man so Marvel, we need to get together!" Before Marvel was granted the use of Spider-Man in the MCU, Sony attempted to reboot the franchise with The Amazing Spider-Man. During pre-production, fans rallied around Donald Glover, petitioning for him to get the role. It only made sense, as Miles Morales was partially based on the actor when the character was being created for the comic books. Glover aged out of the character though, and instead played Aaron Davis, Miles' uncle, in Spider-Man: Homecoming. A deleted scene from the movie established that Miles was part of the official MCU, even though he has never been seen on screen. Many wanted Donald Glover to take on the role of Miles Morales in Spider-Man: Into the Spider-Verse, since he wouldn't be seen, only heard. Having already established his role in the MCU and Sony Spider-Man universe as the man who would become the future Prowler, the role went to someone else, and that someone is Shameik Moore, who played a teenager in Dope before stealing the show as Shaolin Fantastic in Netflix's The Get Down. The actor is now 23, and has also aged out of playing Miles Morales in the flesh in a life-action movie. Miles Morales exists in an alternate universe in Spider-Man: Into the Spider-Verse. He will team up with other superheroes with spider powers from the Spider-Verse, including Peter Parker, Spider-Gwen, Spider-Noir and Spider-Ham. The movie is earning high marks with critics and is currently sitting pretty like a shrimp at sea food city with a 100% score on Rotten Tomatoes. This could certainly pave the way to seeing Miles Morales in the flesh on the big screen. And if Swae Lee has his way, he'll be the guy to bring him there. This interesting tidbit was picked off the The Jasmine Brand tree.